The last two days have been so much fun and all the campers and counselors are having a blast! On Monday, the campers learned new skills and strategies and had plenty of time to scrimmage in the afternoon. The evening activity was the epic camper counselor game, the counselors did not play up to par and let the campers score 7 points against us before the game was called off due to lightning and thunder (which is the reason why this post had been delayed). The final score 15-7. After running through the rain from the field back to the dorm there was a create your own ice cream sundae bar set up for all of us to indulge in. On Tuesday, we scrimmaged in the morning and after lunch had the distance competition as the first part in the disc olympics. The rest of the afternoon had more disc olympics events such as disc golf and MTA (maximum time aloft). The evening activity was TRADE NIGHT! There were tons of trades and purchases going on and at the same time the final event of the disc olympics, disc spinning took place. I have uploaded all of Monday and Tuesday's photos along with Tuesday and Wednesday's newsletters. As soon as time permits I will be putting together a highlight gallery which will severely limit the amount of photos in each of the galleries. The rain held off nicely today which made for a great first full day of ultimate action. Last night and in the morning we had a guest visitor Greg Connelly stop by and talk to campers about Team USA and his experience in Taiwan. For those who don't know, Greg was the 2009 USA World Games Ultimate Team Coach who just came back late last week with a Gold Medal! He coached his team to victory in Taiwan beating Japan in the Finals. Greg was even able to stick around and sell some of the extra gear to the campers last night. After the morning lectures the campers scrimmaged among each other then did grueling team sprints and headed to lunch. Once our stomachs were full we headed back to the fields for some more exciting action which consisted of a few new drills and some more scrimmages. Tonight the campers found out what teams that they will be playing on for the week and had some time to bond with their teams while competing in some teamwork related games. The campers are now, just about sound asleep. Session B has concluded a few hours ago and here I present the last of the photos from Wednesday and Thursday's action. Sweet Baby Blue (Russell and Mac's Team) won the tournament this week in an extremely close match 9-8 against BVH's Relentless Pink. It was a very hard fought game and came down to, as all hard fought games do to, the last point. After the tournament was over the campers headed to the award ceremony then proceeded to pack up and head out. I hope that all of the campers had a wonderful time with us here this week and have a safe trip home via plane, train or automobile. I want to thank them for taking the time to spend a week with us. I additionally want to thank all the parents/guardians, family, friends and fans for following this blog, this week and only hope you had as much fun as I did. Time to prep for Session C which starts Saturday! It has been one wild and rainy day for us here in Western Massachusetts. We started the day off strong by learning zone defense and offense, transitioning our work into three rounds of scrimmage. Unfortunately, the rain continued into the afternoon, forcing our teams indoors for the rest of the day. After some very large lunches, we broke into two rounds of five seminars, ranging in topics from "mental toughness" and "How to run a good practice", to "preparation for a tournament weekend" and "how to start/run a high school ultimate team." The activity for the evening was trade night! I myself traded a jersey and a pair of shorts and was able to pick up 2 new jerseys. 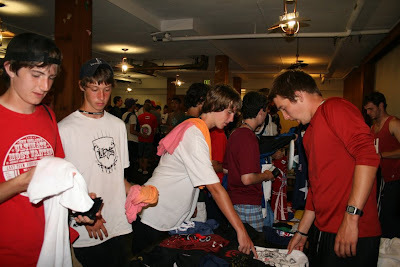 The campers had a blast bartering with each other to score gear from around the world. I will be taking a ton of photos of the tournament action today and will be video taping the "talent show" this evening, so be on the look out for those! Tonight I present to you, photos and tomorrow's newsletter! Today the campers went through stations to perfect their skills and ended the morning session with intense sprints. In the afternoon the campers scrimmaged and saw a slideshow of all of today's action. Tonight after dinner the campers found out what teams they will be playing on for the week including in the tournament showdown! I have broken the photos from today into two galleries a highlights gallery containing roughly 145 photos and all the photos (about 250 photos) that I took today. Here are a few more video clips from the session A talent show! For those that were there, I am sure that you definitely remember this and for those whom this is going to be your first time seeing it, you will finish the video with a smile on your face at the very least. The rules: Lick the double stuff oreo, stick it to your forehead, and eat it without using your arms/hands. Yesterday we was the start of tournament and all the players cleated up and were amped to be playing. There were two rounds of play in the morning followed by another two rounds in the afternoon. After the afternoon pool play three teams had been eliminated. Those teams were: Team Ebae and Russ (Falcon Punch), Team Andrew (Magnum, Blue Steel) and Team Joe and Seth (Pretty In Pink). After the cleats had been hung up the talent show lights were turned on for some hilarious "talents". The oreo eat challenge and the saltine eating contest seemed to be some of the more hysterical acts of the evening. Today the tournament action continued with the semi-finals and finals. In the semi finals was Team Katie and Will, Team Lexi, Team Darden and Team SamBob. Darden's team beat SamBob and Team Katie and Will defeated Team Lexi by a decent margin. This set up the final showdown between Team Katie and Will (aka Egg Salad) and Team Darden (aka The Source - Mufasa Roars Underwater). This was a very close game trading points in the beginning. In the end however Mufasa could not handle the Egg Salad (aka Team Katie and Will defeated Team Darden in the finals). After the finals the Awards Ceremony took place and the campers packed up their rooms and headed on their way home. We hope you all had fun following this blog over the last few days and will continue following us starting Saturday for session B and for those campers who attended session A come back for more fun next year! Yesterday was another day packed full of excitement. The campers practiced with their team in the morning working on different strategies and went over the zone defense. The campers also received their team jersey which they will wear when they compere in the tournament later today. Trade night also took place out front of the dorms where the campers were able to pick up some great gear from all around the US and even parts around the world! As per request I have uploaded two galleries this morning one with the "highlights" (under 90 photos) and another of ALL the photos taken yesterday (450-500 or so). I will be doing this for today and thursdays photos as well. Additionally last Saturday thru Monday will have a highlight gallery created soon. Yesterday we saw more intense ultimate during the day and at night (under the lights, on the brand new turf field!). The campers took on the counselors in the annual grudge match. The final score was counselors 21-5 followed by another short game 5-1 again counselors taking the match. One point to be made is all the points were very close which the score does not reflect. I am proud to present all of the photos taken today! Today has been a very exciting day learned new drills and improved on the fundamentals in the morning and had intense scrimmages in the afternoon. Tonight the campers found out about the teams that they will be training with and playing with for the rest of their time at camp including tournament wednesday and thursday. As per request from some of the campers I will not be selective in what I put online instead I will throw all the pictures from the entire day online. Later on I may put together a highlights gallery of all the photos of the week that are my personal favorites. I have also posted tomorrows newsletter online as a sneak peek before any of the campers have seen it. The campers get the daily newsletter Bring It In every morning at breakfast. Welcome to the 2009 NUTC Season! Due to the change in campus from NMH to Amherst College took a little longer than expected to get everything set up (mainly finding internet). Nonetheless I, Brian Cook, will be capturing all the moments at NUTC for all three sessions. So now, I present to you the first update of the season: all photos from day 1 of NUTC Session A! You can find them online here. Don't forget to check back here nightly starting tonight for more exciting updates!